Were Tefillin worn in the Midbar (40 years of wandering) before the Jews entered Israel? If so what Parshiot were in those Tefillin? According to those who say Moses wrote Deuteronomy at the end of his life, how were the 2 Parshiot from Deuteronomy in the Tefillin? It seems according To the Ritva in the name of Rav Hai Gaon that Hashem had already shown Moshe Rabeinu at Har Sinai in the נקרת הצור (stone crevice) how to make the Tefilin shel Rosh with all its details which would include The 4 batim and 4 Parshios. The 2 Parshiot in Devarim are the wrtten text what Moshe rabeinu had already known and taught Klal yisroel how to make Tefilin for themselves which parshiot to fill the 4 batim in the tefillin and Hashem also put on Tefillin with 4 parshiot in corespondence to their Tefilin See Gemora Brochos 6b. Our Sages propose a very unusual source for splitting the Tefillin that is worn on our heads into 4 separate sections. The Torah calls them Totafot, which is a combination of two foreign words, each meaning "two." Why did the Torah teach us to make four sections by adding two and two? Why didn't the Torah just use a word meaning "four?" Harav David Cohen (Cong. Gevul Ya'avetz, of Brooklyn, N.Y., author of Ohel David, 4 vol., Aidi d'Zutar, 2 vol., etc.) suggests an original approach to this question. This week's Parasha tells us that the Jews were commanded in Egypt to place two passages from the Torah "as signs on our arms and Tefillin on our foreheads." Presumably they did so immediately, making themselves their first pairs of Tefillin. However, doing so would be somewhat problematic, since Tefillin include more than just those two passages. They include two additional passages, "Shema Yisrael" and "v'Haya Im Shamo'a," which Moshe only told the Jews 40 years later, when they were about to enter the Land of Israel. We must conclude, continues Rabbi Cohen, that the Jews were only required to put two of the traditional four passages in their Tefillin for the first forty years. This, explains Rabbi Cohen, is why the Torah split the total number of passages into two sets of two. This was meant to show that the original installation of the passages in the Tefillin was done in two stages: the first two of the four were installed upon leaving Egypt, while the other two had to wait until some 40 years later! A reader, Chaim Schild of Spring Valley, N.Y., pointed out that Rav Menachem Kasher discusses the issue of which passages were included in Tefillin during the 40 years of wandering in the desert (Torah Shelemah, Milu'im following Parashat Bo, vol. 12, p. 249). 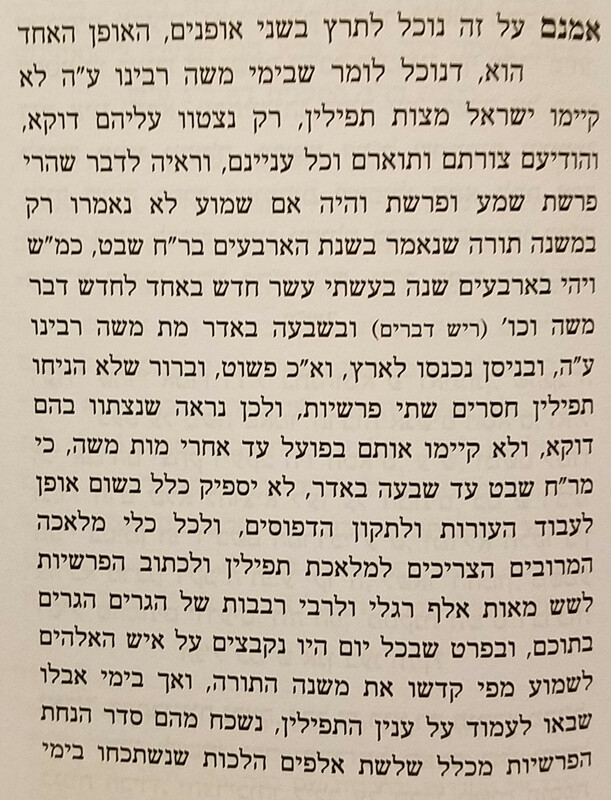 Rav Kasher cites the Kasa d'Harsena (footnotes by the author of Besamim Rosh, #24) who raises the possibility that Tefillin in those days consisted of only 2 passages instead of the requisite 4, but remains in doubt as to whether such a hypothesis is justifiable. The last Lubavitcher Rebbe, Rav Menachem M. Shneerson, also adopts the view that the Jews wore only two passages in their Tefillin while wandering in the desert (Sichah of Va'etchanan 1989, p. 52-53). They did not wear Tefillin in the Midbar. They did wear Tefillin in the Midbar, perhaps only from Har Sinai, perhaps even from leaving Mitzraim, but they already had all four parshios. 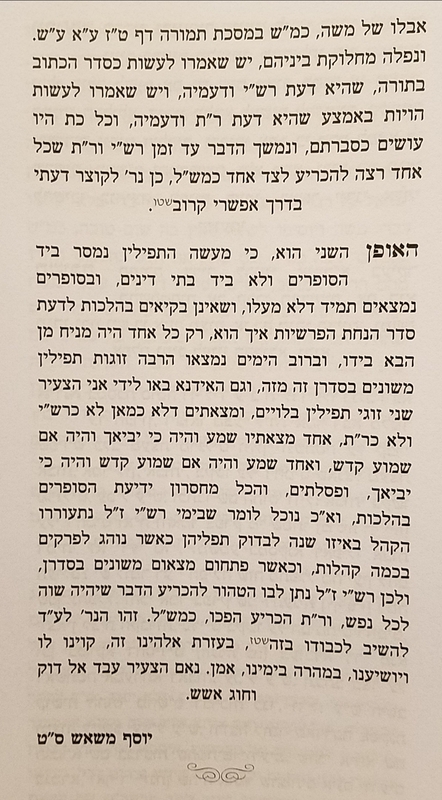 Rav Yosef Messas in Mayim Chaim 1:206(new version and old) is discussing how the machlokes of Rashi and Rabbeinu Tan teffilin is possible if people always wore teffilin. Rav Messas first answer explains that it could be that klal Yisrael did not wear teffilin in the midbar since there are two parshiyos that would be missing from the teffilin. He explains that Moshe was commanded and showed all the pratim of teffilin ,but they would only wear them after the death of Moshe Rabbeinu. He also explains the machlokes happened due to the 3000 halachos that were forgotten during the mourning of Moshe Rabbeinu. This explanation did not sit well with Chacham Ovadia Yabia Omer 1:3 who holds they had all 4 parshiyos,like the Rashba Menachos 34a. Not the answer you're looking for? Browse other questions tagged halacha-theory tefilin dor-hamidbar deuteronomy . Is it proper to put away the tefillin before the end of Shacharit?